As consumers, we think of “nutrients” as something good and even necessary to support maximum crop yields. But pollution occurs when the amount of nutrients present or applied to land are more than can be used by plants. 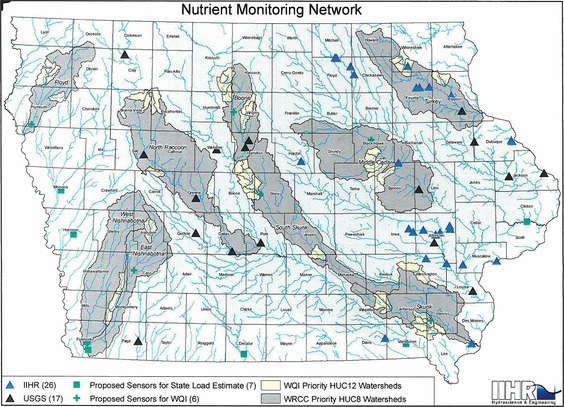 Excess nutrients (nitrogen and phosphorus) that are discharged into our water are wasted resources and pose significant, costly risks to human health and the environment, both here in Iowa and the Gulf of Mexico. The Iowa Nutrient Reduction Strategy was introduced in 2012 with a stated goal to eventually reduce the state’s contribution of nutrients in rivers, streams and lakes by 45%. However, in order to see those results many things need to happen – including agricultural accountability, effective monitoring and sustained funding. Source water quality is a vital interest of Des Moines Water Works, which has been increasingly threatened by agricultural pollution. Because of this interest, Des Moines Water Works is pleased to recognize progress in water quality research and monitoring of Iowa’s rivers, lakes and streams, by initiatives currently being developed by the IIHR – Hydroscience and Engineering program at the University of Iowa, headed by Dr. Larry Weber. IIHR has been a worldwide leader in hydrology and fluids-related research for nearly a century. The IIHR is focused on science-based research, independent of Iowa Board of Regents’ bias. Research at IIHR includes a network of 28 water quality monitoring sites throughout Iowa. State-of-the-art remote sensors provide near real-time data (every 15 minutes), that measure nitrate, dissolved oxygen, water temperature, specific conductance, and pH. Researchers at IIHR have also developed an easy-to-use web platform, the Iowa Water-Quality Information System (IWQIS), to disseminate and interpret the sensor data. IWQIS displays near real-time data on nitrate and other water-quality variables from in-stream sensors across Iowa in a user-friendly interface. This new information makes it possible for all interested Iowans to use a science-based approach when making decisions that affect water quality. 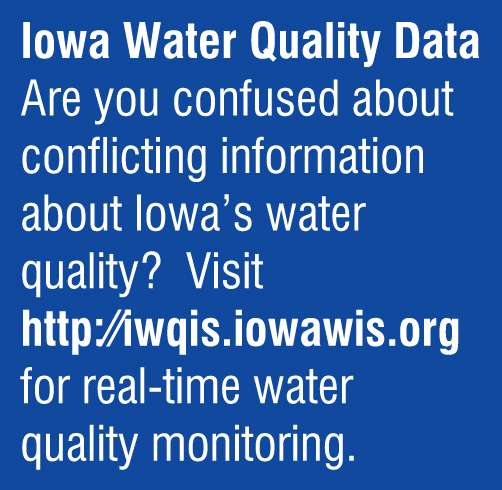 Des Moines Water Works encourages citizens to visit http://iwqis.iowawis.org to view this interactive tool containing real-time water conditions and historical data. IIHR’s monitoring network will expand to 55 sites in 2016. Coverage will include all the state’s major rivers. For the first time, water quality researchers will be able to quantify many important parameters, including the total amount of nitrate leaving Iowa via the state’s rivers and the effectiveness of specific nitrate mitigation efforts. Des Moines Water Works remains committed to protecting Iowa’s water by holding agriculture accountable for environmental protection, just like any other business who discharges into Iowa’s waterways. The water quality monitoring and public data collected and compiled by IIHR and presented by the IWQIS are important steps to assess the condition of Iowa’s waterways, quantify the effectiveness of water quality efforts, and track progress toward meeting water quality improvement goals. Please support IIHR’s leadership in science-based environmental protection.